This was to be the first film in a trilogy that never materialized. Of interest: the psychiatrist is played by David Cronenberg. Noel Murray, The Dissolve: "At its best, Nightbreed is like a living version of a coffee-table book, with each page filled with tentacled, quilled, or moon-faced monsters." Austin Trunick, "Under the Radar": "The plot unfolds with sudden jerks; less attention seems like it was paid to this film’s story than worldbuilding and mythologizing. (All the chatter about ancient tribes and prophecies feels like something out of Cannon sword-and-sorcery film.)" Brian Orndorf, Blu-ray.com: "The Cabal Cut finally captures what Barker was after, warts and all, reinstating depth, emotion, and a human presence to the story, which finds its fantasy footing once again." The Wikipedia page includes interesting backstory concerning Barker's intentions. The director's cut is now streaming on Netflix. (I'd provide a link but I sort of hate how Netflix streaming works now; I can add a title to my watchlist...sometimes??). I think my favorite of the freaks is the one who looks like Mac Tonight. Speculative tidbit: I suspect this movie was the inspiration for the Palladium Games tabletop RPG module Nightbane. CheesesOfBrazil, I thought the same thing. I assumed it was a given that it was an RPG version of Nightbreed. And yes! Its Mac Toniiiiiiiiight! Hahhaha. I mean. I know it's not a good movie, but I like the book, I like the idea of Ol' Buttonface, I like Lori and I wish it would have been more coherent so we could have had more. Also, cortex and griphus talked about it on their podcast. Speaking of influences, I also gotta think the Babette character in this was the namesake for Skyrim's Babette. IIRC, the guy who haunted the Usenet rpg groups, trying to convince people that Nightbane was the best game ever, hatred comparisons to Nightbreed. He was something else-not at the level of C++, but definitely heading there. Also, now I remember the comic sequels to NightBreed. The plotting problems weren't just a problem with the movie- the comic really seemed like it had no idea where to go. Man, did I want to like this movie. I think the essential concept is a fine one -- I always like monster movies where the real monsters are the humans. But this felt unbuilt, like instead of careful world building, we just had passing shots of a bunch of people in costume, and that was supposed to represent an entire society, and didn't. And, good Lord, the lead actor was so dull. 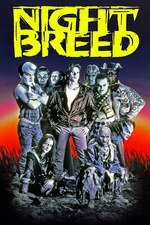 I like to think the sequel would have involved a full-on Church Vs. Freaks conflict, spearheaded by the fallen priest guy in this one, who evidently developed a serious grudge against the nightbreed pretty quickly. I always like monster movies where the real monsters are the humans. Any better examples? I'm trying to think up some but coming up empty. It's the climax to the novel I Am Legend, and is an ongoing theme in Guillermo Del Toro's work. Also, it's the ultimate point of most significant zombie movies. This is also a major component of why the Will Smith film was garbage and a waste of the IP. Forget the AMC show, a more accurate adaptation of The Walking Dead would be Robert Kirkman tiresomely shrieking "Humans are the real monsters!" over and over and over again.